Today I don't want to be a goat keeper anymore. 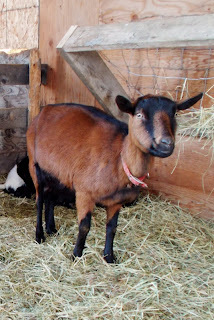 That feeling will pass in time and I will remember instead all the reasons why I love my goats; from their sweet faces and waggily tails to their yummy milk to make soaps and cheese. I will remember how sweet newborn goat kids are and the feeling of joy when it all goes like it is supposed to. But, not today. Today, I don't want to be a goat keeper anymore. Today, I lost Sapphira to complications during kidding. We had not planned on breeding Sapphira this year. Though she could be bred, we had intended on giving both she and Abigail another year to mature and Ellie and Ruby a year to rest. However, unsatisfied with three does to breed in his pasture, Jedi had other plans. He escaped his pasture and spent the night with the other does several months ago. We hoped that the does hadn't been bred, but some of them had. Sapphira did not appear pregnant. We watched for tell-tale signs of pregnancy and seeing none, were relieved. That changed a few days ago when her udder suddenly became enlarged (sometimes called 'bagging up'). We started watching for signs of her going into labor. Last night, Sean came inside to report that labor had begun. We moved Ellie and Pepper back outside into the barn, cleaned the basement stall, put down fresh bedding and brought both Sapphira and Ruby inside with us. Since this was Sapphira's first kidding and she was especially close with her mom, we thought keeping Ruby with her might be comforting to Sapphira. Sapphira began having contractions, but they were far between. She had a little creamy mucus coming from her, but it appeared to be early still. We slept near her in the basement, checking through the night. Sapphira was eating hay, walking about, relieving herself and sleeping. She had a few contractions, but did not appear distressed about it. She slept most of the night next to Ruby. In the morning, we expected labor to begin in earnest, but it didn't. A couple of hours passed with no real progress. Sapphira was still eating and walking around. Occasionally, she'd stop for a short contraction, but then continue on. We started to get concerned. This was only the second birthing we had assisted and it was nothing like Ellie birthing Abigail and Asher. Then, we saw one tiny white hoof appear and contractions began getting closer together. I was a little relieved seeing the hoof peek out with each contraction. I thought that she was finally getting down to it and that she'd have her kid shortly. But, she didn't. She still was not having regular contractions and the ones she had seemed too short to do much. I tried smoothing my hands down over her back and belly, pushing with her when the contractions came. I started to fear that the kid had died. Sean called our vet to discuss the situation. Armed with instructions on assisting the kid's birth, Sean worked with Sapphira's contractions to insert his fingers gently into her to try to discern if the kid was presented properly. Sean was unable to get both hooves out. Sapphira needed more help than we could give her, so we had Chris come out to assist. When Chris arrived, he evaluated the situation, but the diagnosis was not good. He told us the kid was not only dead, but had probably died days ago and had already begun to decay. Sapphira's uterus was not dilating properly. The kid was turned backwards and presenting hind feet first. While Sean and I held Sapphira, petting and soothing her, Chris got to work, lubricating the birth canal and easing the kid from her. It was a very long process and unpleasant for everyone. Sapphira was clearly in pain and scared with what was happening, even with Chris working as carefully as he could and trying to work along with her contractions. We tried to comfort and reassure Sapphira. After working for a while, the kid was delivered, but Chris looked grim. He felt inside Sapphira to make certain but, Chris informed us that Sapphira's uterus was opened into her abdominal cavity. He concentrated and felt some more to be absolutely sure, but I could tell from the look on his face that the prognosis was dire- our worst fear being realized. Chris said he sees this once every few years. A kid or calf turned backwards, its hooves cut through the uterine wall and pushes into the mother's abdominal cavity. When the water broke, it did not rush from Sapphira, but filled inside her. The kid suffocated inside. Sapphira's body attempted to eject the kid with intermittent contractions, but couldn't because she was not dilating. I don't know why Sapphira was eating and walking around. I don't know why she was not behaving like she was in pain, but she wasn't. I have watched 3 hours of footage of what I hoped was going to be a happy, normal kidding- there is nothing to suggest this. Replaying it all, I looked for it- closely. (Ironically, if the birth had gone well, I would have posted video and pictures from it but now, I don't want to leave you with those pictures, so I posted images of Sapphira from happier days, instead.) Chris assured us that there was no way for us to tell this was happening. That helps a little, but it does not stop my mind from fretting about, "What if..."
If she hadn't been ruptured inside, we would have opted to treat her for the very likely infection from the necrotic kid. Sapphira was clearly in pain and shock, she was bleeding heavily. Sean and I made the decision that we had to let her go. In the end, I held Sapphira's head and petted her while Chris administered the barbiturate to euthanize her. It was terrible, but very quick. I debated sharing this with you, but this is what happened. This blog is a record of our journey, both the ups and the downs. We have been honest with letting you in and sharing with you all that building this life means for our family. So, we share this with you, too. There will be other births here at Lally Broch and no doubt, other deaths. The pain in my heart for this senseless loss will fade with time- because that is what happens, time heals. But, for right now, for today, it hurts very much. Thanks for bearing witness with me tonight of Sapphira's passing. I wish with all my heart, I'd had better news to bring you. It is incredibly brave of you to share this experience when it is so fresh in your mind and heart. I hope that time will help to heal this wound and dull the heartache. I admire your willingness to share this information in the hope that your readers will learn not just about goatkeeping, but also about the realities of life on the farm. Tears are coming down, my throat is frozen and my heart aches for your heart. What a beautiful girl, and I'm sure it was a beautiful baby, too. I'm thinking of you and hoping you'll allow lots of room for grieving. How very sad. I'm so sorry for your loss. Thank you for having the courage to share this down side of farming with us. I believe it's important for all of us to remember that it isn't always fuzzy babies, happy smiles and joyful outcomes -- but sometimes dirty and messy; tearful and just really, really sad. Thinking of you and hoping today is a much better day. Thank you for sharing your experience and your grief. All of us who love animals and living sustainably understand the pain that comes when we lose a beloved friend. This is also part of your story; that which shows you to be generous and loving keepers of those animals in your care. Death is never easy, making her journey easier was a true gift for Sapphira and a sober reminder to those of us who want to make changes in our lifestyle to include animals. There is a time to be born and a time to die...a time for joy and a time for tears. You are in my thoughts and prayers today. I'm so sorry you lost your sweet girl. Thank you for sharing your story. 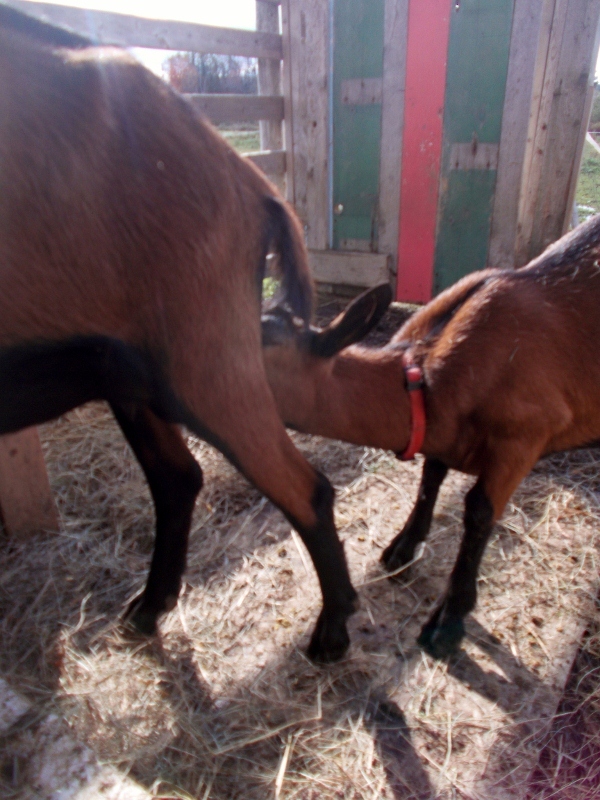 We are new to goats and had no idea this could happen. SO sorry for your loss. Thank you for sharing your journey with us...the good and the bad! I am so so sorry for the pain and sorrow you are going through. Farming is joyful and painful. Life and death. I know how much you love all your charges, and I can't imaging how hard this was. Thank you for sharing, and being so open and honest about a really hard couple of days. We love you. I know you will feel better and continue to take great care of your animals/friends. I am so, so very sorry for your loss. I don't even have the words to say. Thank you for sharing this with us. I am glad that you chose to write about it and show us the loss that can and will happen when we choose to love our animals. Your family is in my thoughts and prayers. Aw, Sonja and Sean,I am so so sorry for the pain and sorrow you are suffering. I know how much you invest emotionally and every other way in all your wonderful creatures. I cannot know how sad you must feel. You are such wonderful examples of great stewards for the critters in your care. We love you and wish you better days ahead. Farming can be so hard, exposed to joy and pain. I know you will continue to take great care of all your charges. Thanks for sharing and being so honest with a really difficult day in your lives. 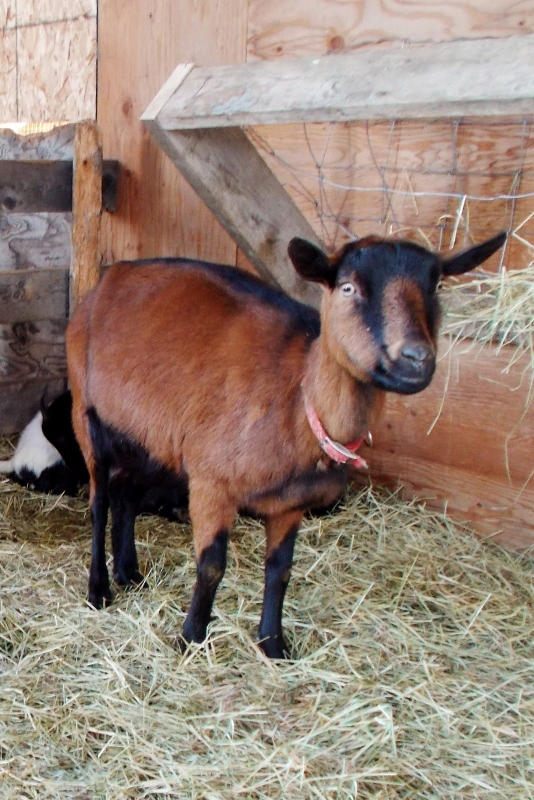 Sapphira will live in our memories, and you will have more goats, cheese, soap, milk and joy. I don't think I could express how sorry I am that you had to have this experience. Thank you for being brave enough to talk about this openly. I am so sorry for you loss. It is always heartbreaking when you have to make that choice to let go. I am grateful that you shared such a difficult experience and hope that as time passes your hurt will be lessened and only the loving memories remain. I'm so sorry. Unfortunately, when you have animals and especially when you breed them, sometimes things go wrong and you lose them. It's hardest when those animals are young and should have lots of years ahead of them, and having to make the decision is the hardest part. Letting them go can be the greatest kindness we can give sometimes and you need to remind yourself of that. I am so sorry for your loss. When we lose animals on the farm it breaks my heart. Losing a life is always heart breaking especially when we are so close to them. When we have something "traumatic" happen with an animal I feel it is God's way of teaching us so we know what to look for shall another animal have the same situation. I am so very sorry to hear about Sapphira. I remember how excited and proud you were to add her to the farm. Farming is a constant mix of good and bad - thank you for sharing even the bad parts, and know that you did the right thing. She had a great life with your family, and in the end you were there comforting her. Keeping your family in my thoughts and prayers. I am going to attempt this again, I get to snorting and crying each time. I wish I was there to bring you a box of chocolates, a box of tissues and lots of hugs. I know that may have been the toughest post you have written to date, but it shows how awesome of a farmer and blogger you are. This may help someone else in the future. Know you did the very best for Sapphira that you could have. You are all in our prayers. If you need to talk feel free to call me. I love ya'll and grieve with you. Oh family...I am so sorry for your loss. I am not claiming to know your pain because it is yours and unique to you, but I know what it is like to lose an animal that you love so dearly. Don't spend time second guessing yourselves, we all know that you did the best you could, we would expect nothing less from your dear family. Thank you for sharing with us, we are praying for you. Oh, I'm so sorry. My heart hurts for you. I know that was hard to share with us, but I know, at least for me, it was a beautiful reminder of how much we all love our animals. I am so very sorry for your loss..I only read about it now. I had just talked to you Sonja that very morning and I was really hoping the best. My biggest hug to you...you are in my thoughts and heart. Love you! I just saw that you lost Sapphira. What a heart-breaking story. I am so sorry. I know you must be sick about it. She was a lovely goat, and I am sure you miss her. Hang in there. New joys will come, and you will be happy that you are farming. It is heart breaking when we loose an animal. We grow fond of the animals and loosing one can be depressing. But never give up Sonja, remember when we loose one animal we get two more in return.